The marching band community knew and appreciated Patrick Henry Hughes even before he and his family gained national attention on a February 2008 episode of Extreme Makeover: Home Edition. Patrick has performed with the University of Louisville Marching Band since 2006, and Bands of America named a national parent booster award in honor of his father in 2007. (See related story). So it's great to know thateven with newfound fame and national television exposuremarching band is a core part of Patrick's new book titled I Am Potential. In fact, the book cover shows a photograph of Patrick in his band uniform. Patrick's story is extraordinary. A congenital birth defect left him eyeless and wheelchair-bound, unable to walk or fully extend his arms. Yet, with assistance from his father who maneuvers his wheelchair, Patrick is able to perform in the marching band's field show. Patrick explains in chapter one that, "My parents were my earliest and best teachers. But, before they could teach me about acceptance, they had to learn themselves. It wasn't easy, and to hear them tell it, they had to go through a crash course that started with letting go of their hopes and dreams, and especially their dreams for me. Pretty tough, but you can't move forward unless you're willing to accept where you are." Move forward is exactly what the Hughes family has done. At the age of 20, Patrick is already an award-winning pianist, singer and trumpet player who has performed at the Kennedy Center and the Grand Ole Opry. Now, Publishers Weekly is including his book on a list of "hot independent press titles for the fall." The book tells the story of the Hughes family's faith, courage and perseverance. Father and son take readers on a journey from the day of Patrick Henry's birtha joyful event that quickly turned devastating as the extent of his disabilities became clearthrough his struggles and eventual triumphs, sharing eight life lessons they learned along the way. The publicity material for the book includes a quote from Carol Besse, co-owner of Carmichael's Bookstore in Patrick's hometown of Louisville, Kentucky. "Patrick Henry Hughes is someone who has become a celebrity for all the right reasons," Besse says. "He is an inspiration to everyone who knows him and will become an inspiration to everyone who reads his book." 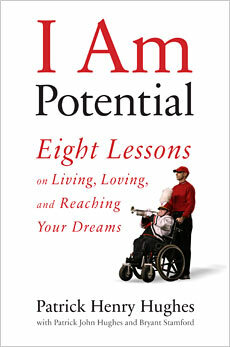 I Am Potential: Eight Lessons on Living, Loving, and Reaching Your Dreams by Patrick Henry Hughes with Patrick John Hughes and Bryant Stamford, is available in hardcover and audio editions. For more information about the book, visit IAmPotentialBook.com. You can meet Patrick in person at these author events surrounding the release of his new book. Source material courtesy of Da Capo Lifelong Books.